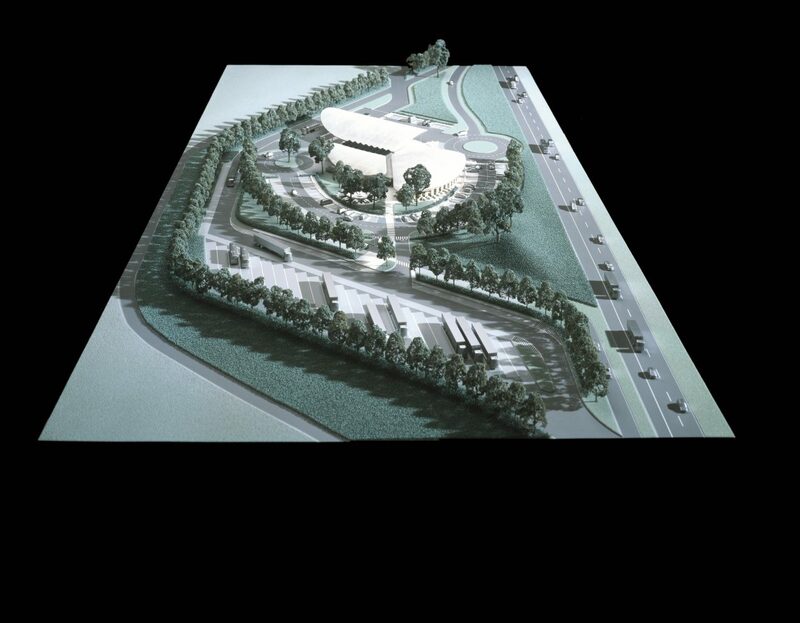 North and South) : 67.223 sqm (2005-2008); (01-497). 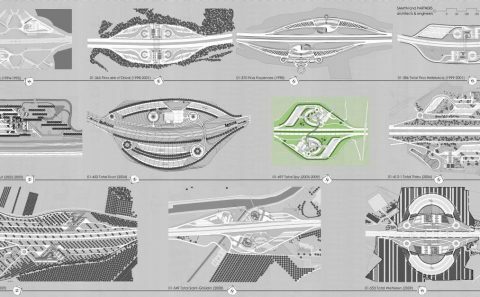 This project has the ambition to reconcile driving with the love of travel, the world of the highway with the environment, safety with comfort – in other words, the practical with the pleasurable. 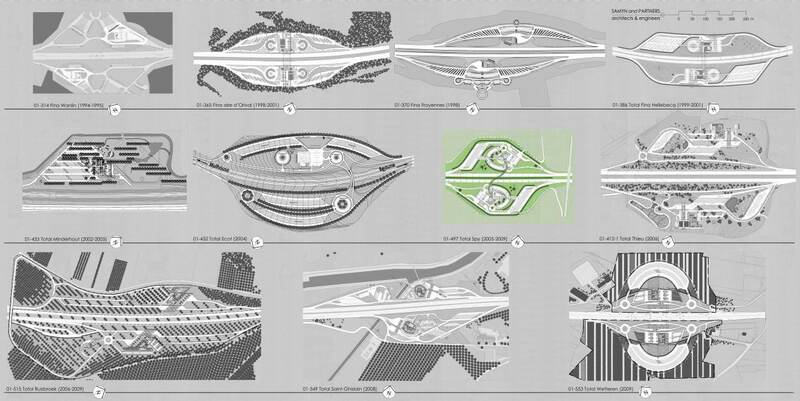 As a sailboat on the sea, a flower in a field, a glider in the sky, or the music one listens to in a car or a truck. 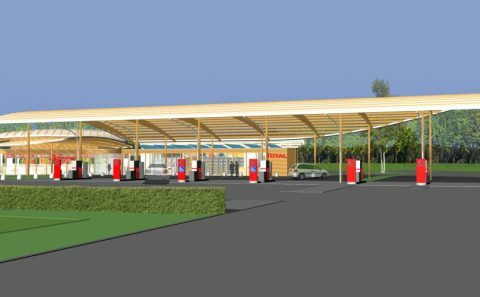 The compactness of this project aims to maximize green spaces, minimize asphalt surfaces and to optimize the functionality of the service station. 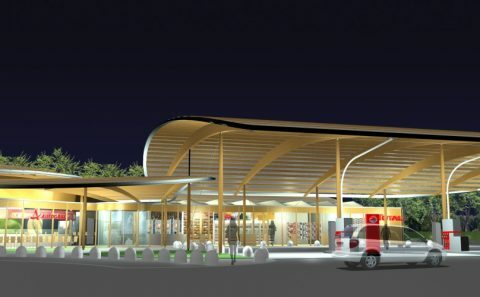 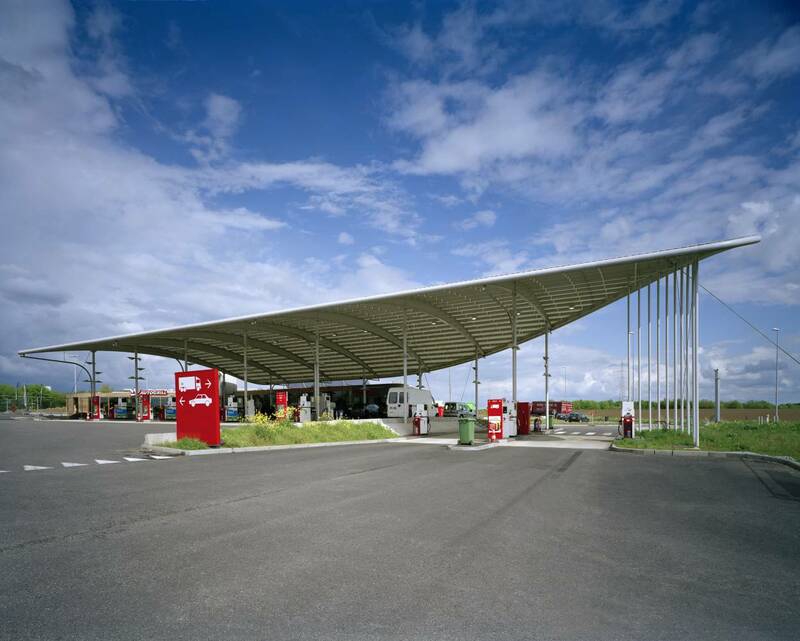 With concern for fluidity, harmony and efficiency, the formal composition and the functional organization of the rest station is structured as a spiral surrounding the service station that is clearly marked by the entrance patio to the building. 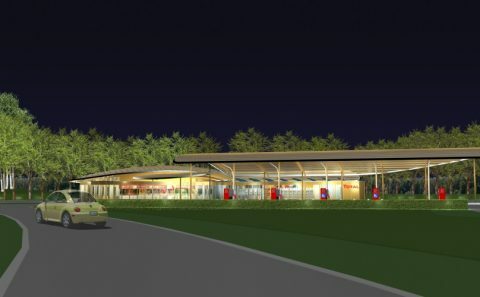 It provides a rallying and meeting place for the entire rest stop. 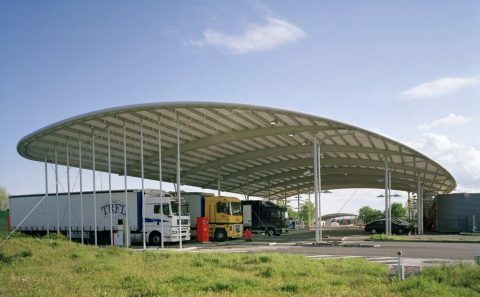 Around this central space are wing-shaped roofs of white PVC membranes stretched over light-colored wooden glulam structure. 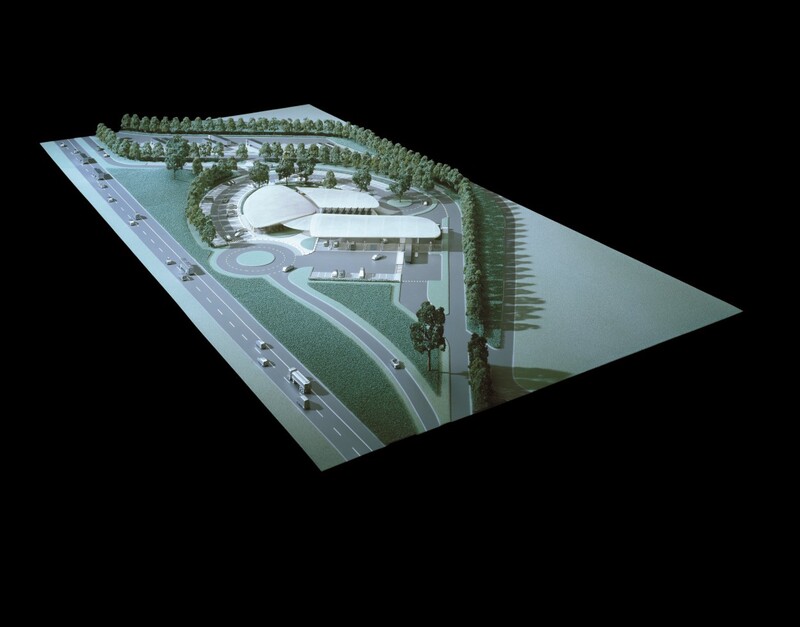 These distinctive forms visually signal the service station from the highway. 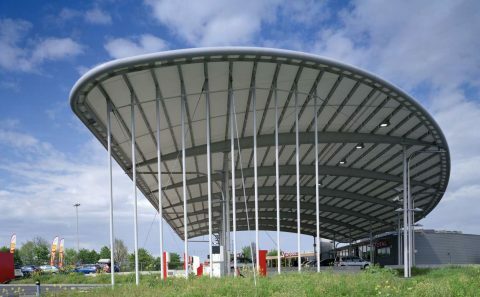 The various wings cover a single pavilion structure that includes all the service areas of the station. 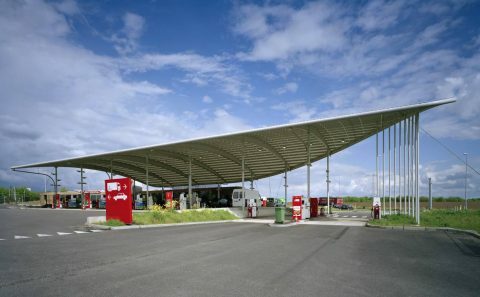 Nevertheless, each wing signals a specific group of services: the fuel pumps are situated beneath the principal awning, the entrance is situated beneath the smaller of the awnings, the shop and attendant services are situated beneath the awning parallel to the fuel pumps, and the restaurant is situated beneath the dome-shaped awning. 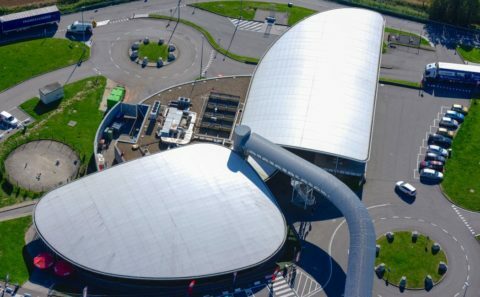 These wings and the dome in PVC membranes are brightly lit at night, thus providing a recognizable and highly visual signal. 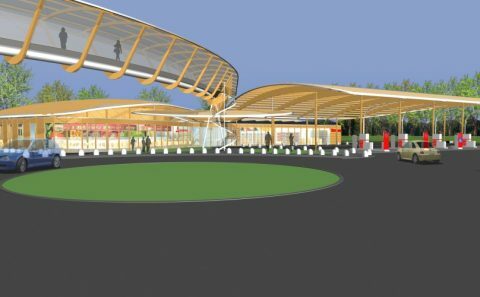 A wood and metal footbridge also covered in PVC provides a visual link between the two stations on either side of the highway—much like a cord connecting two kites. 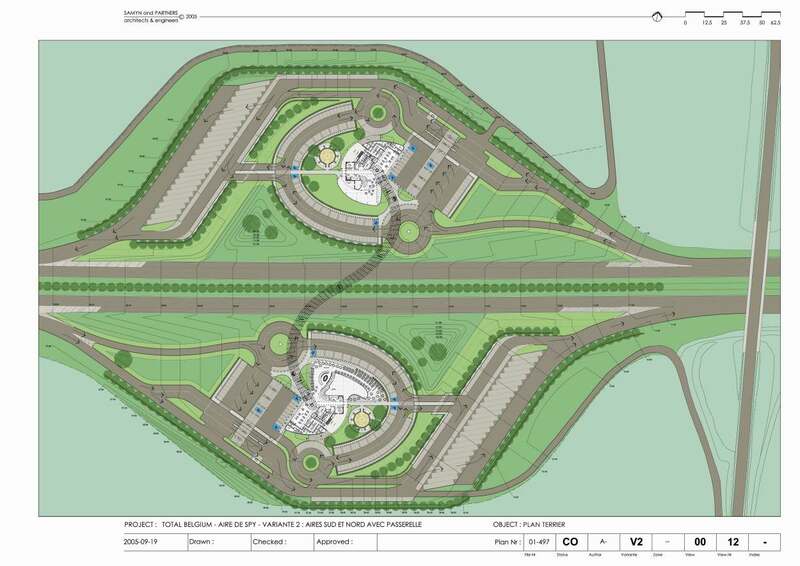 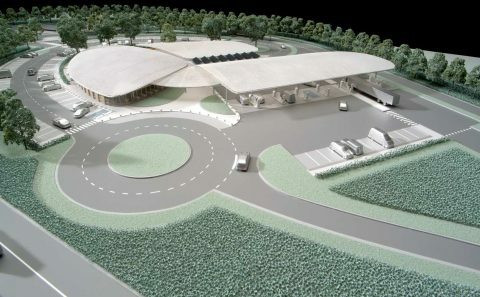 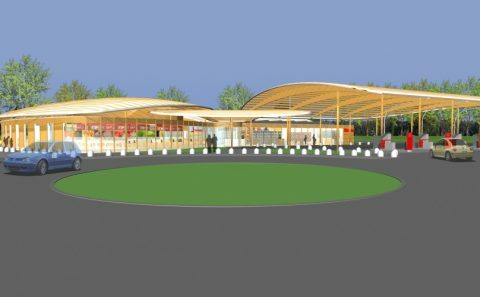 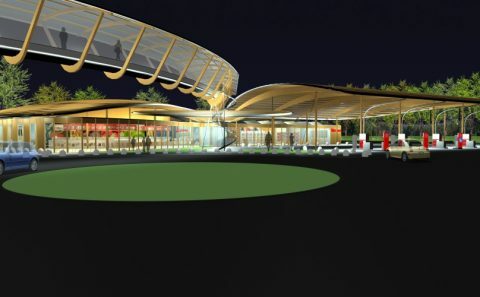 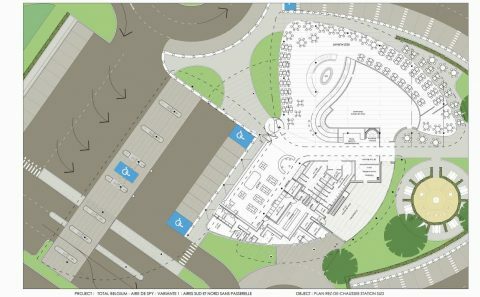 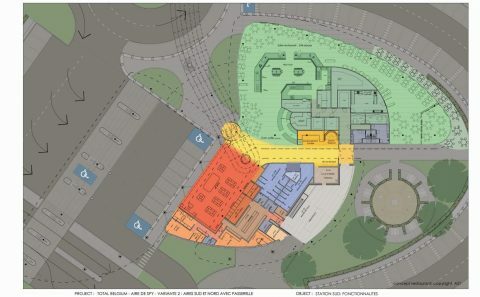 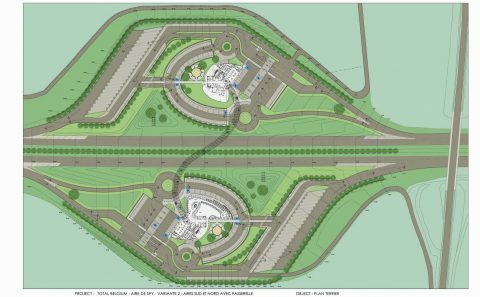 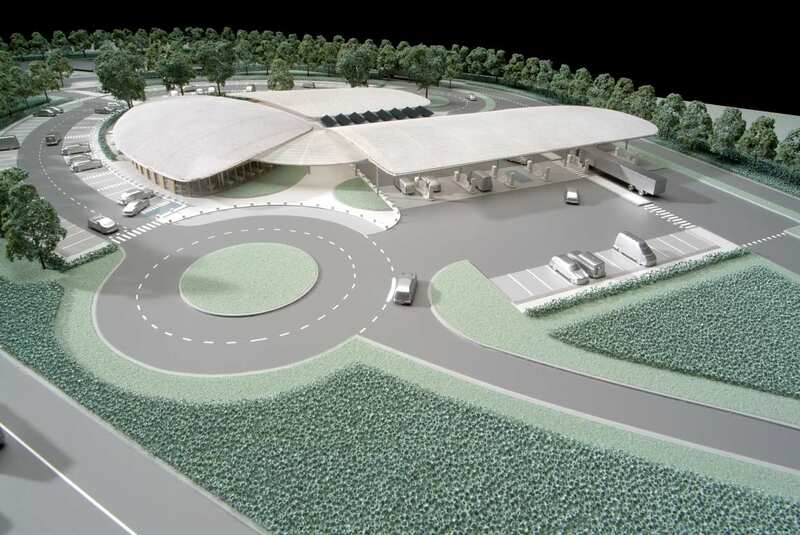 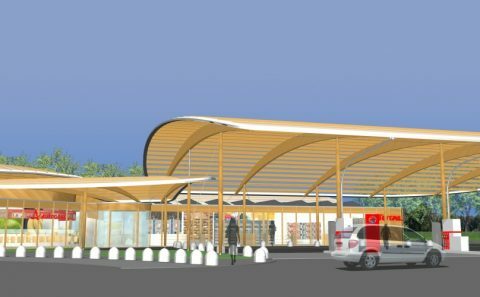 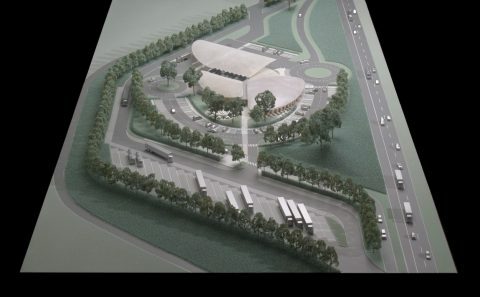 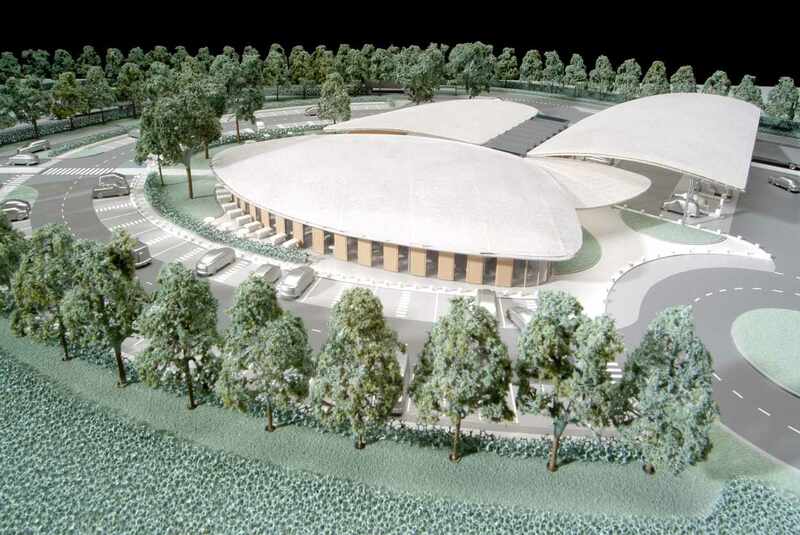 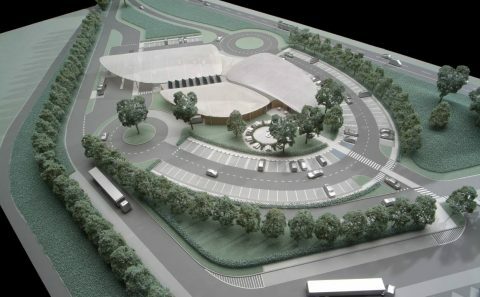 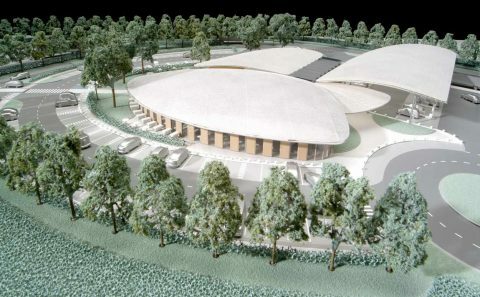 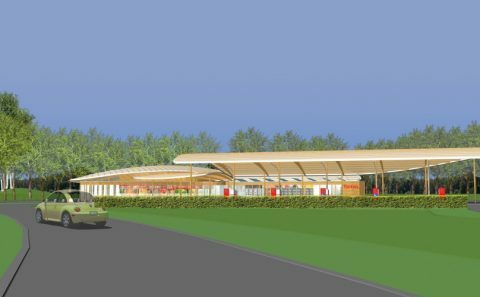 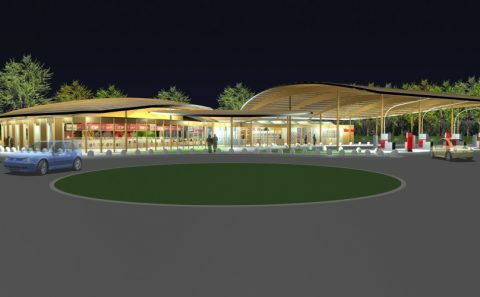 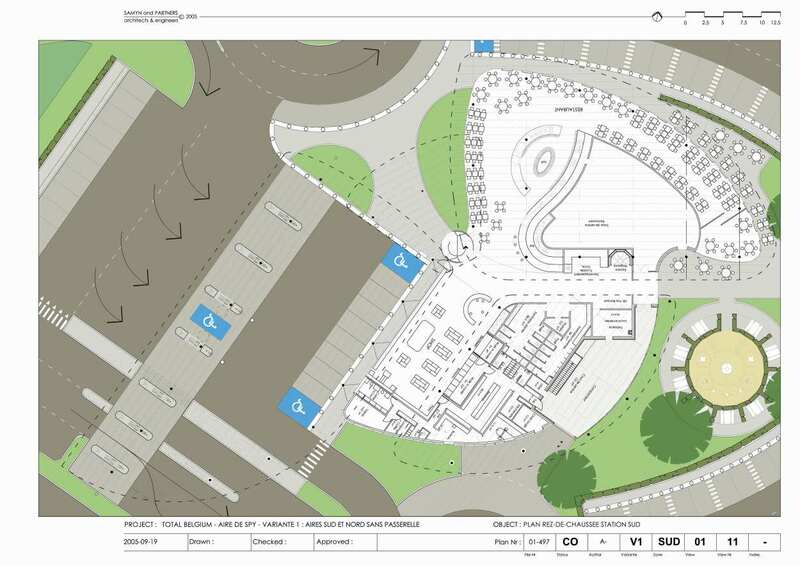 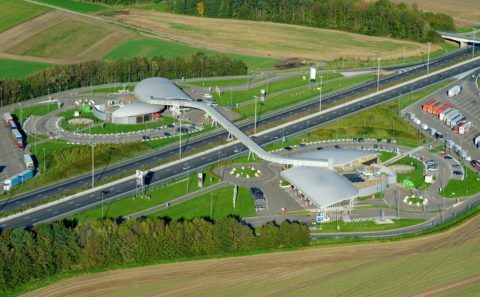 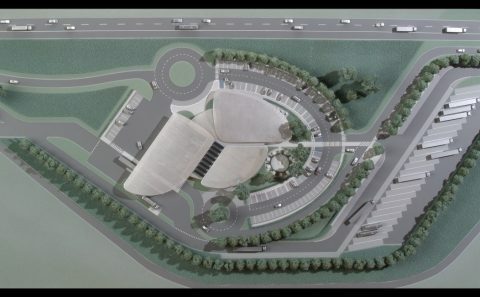 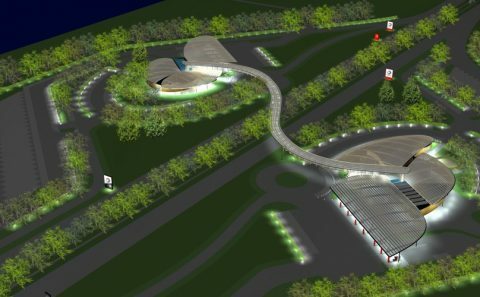 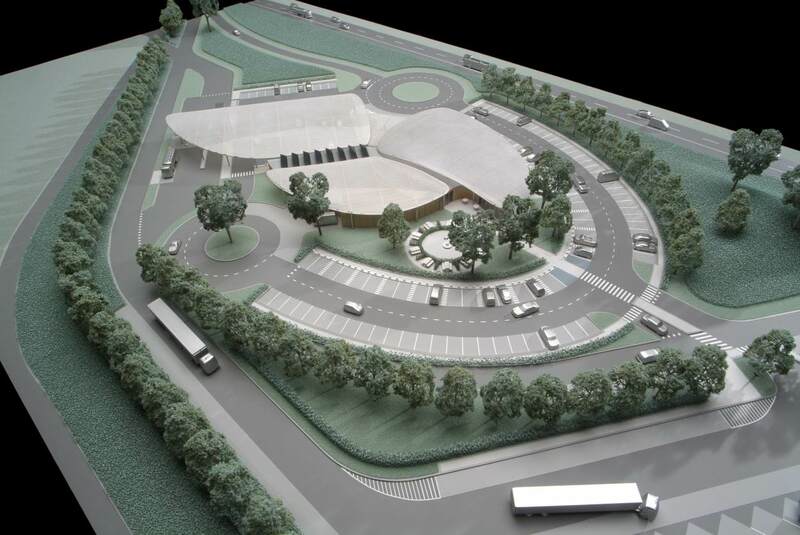 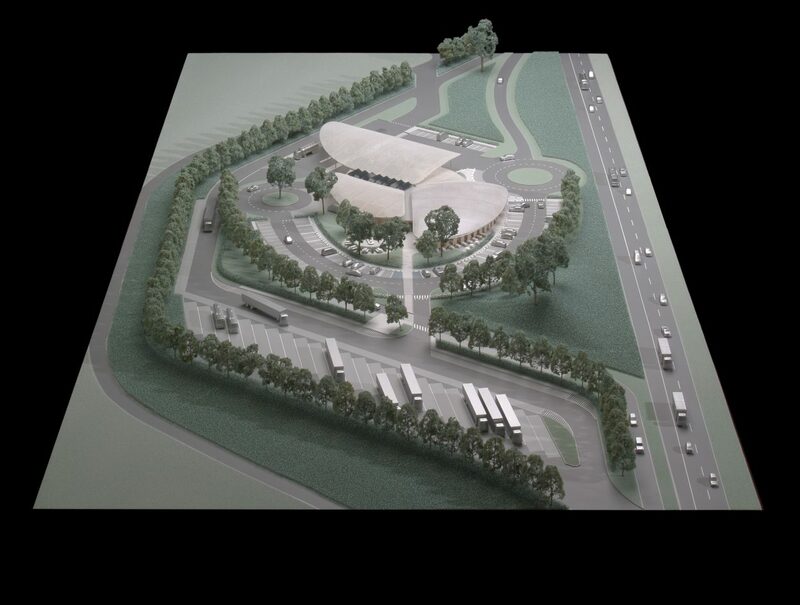 The oval plan for the parking spaces that surround the building enable easy surveillance from the building itself, a concentric grouping of the services at the rest stop, and a clear delimitation of the reduced speed circulation area around the service station. 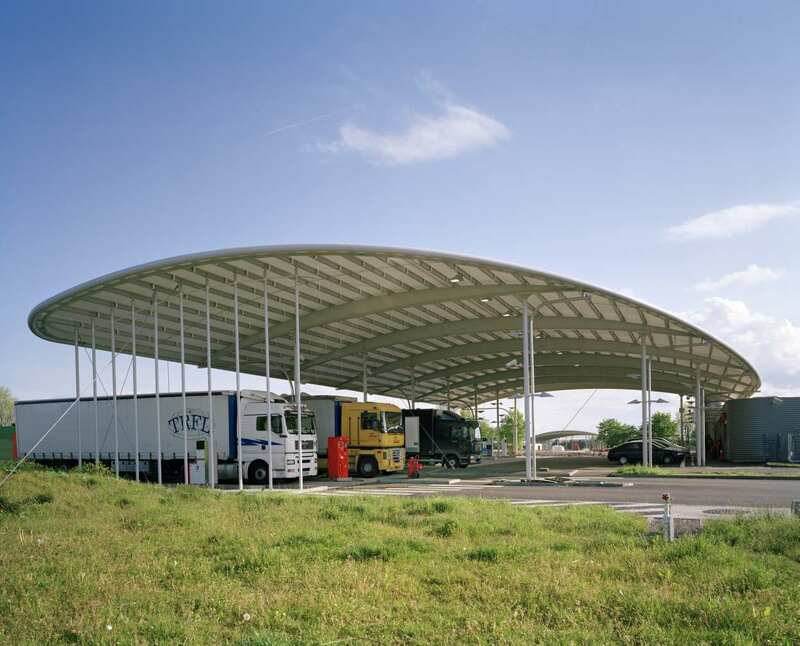 The roads leading to the specific service area for buses and trucks is situated at the rear of the buildings in order to avoid obstructing the view from the highway and to minimize the visual impact of these large vehicles on the general landscape. 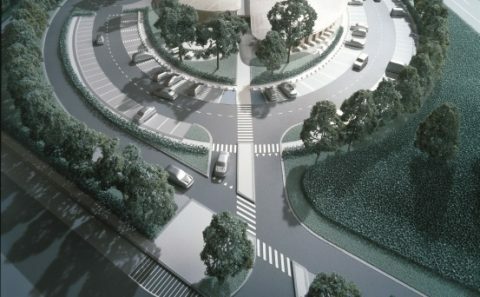 In the same spirit, the roads and the parking area are visually concealed by a knoll, hedges and trees. The visibility of the station from the highway is thus concentrated on the building itself, its roofs in the form of white wings and the screen of vegetation. 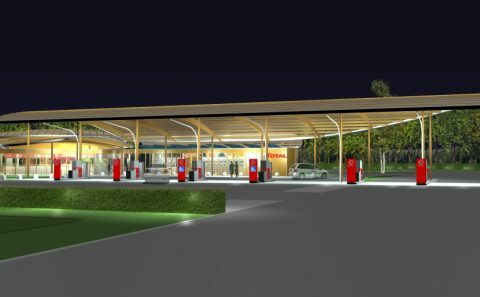 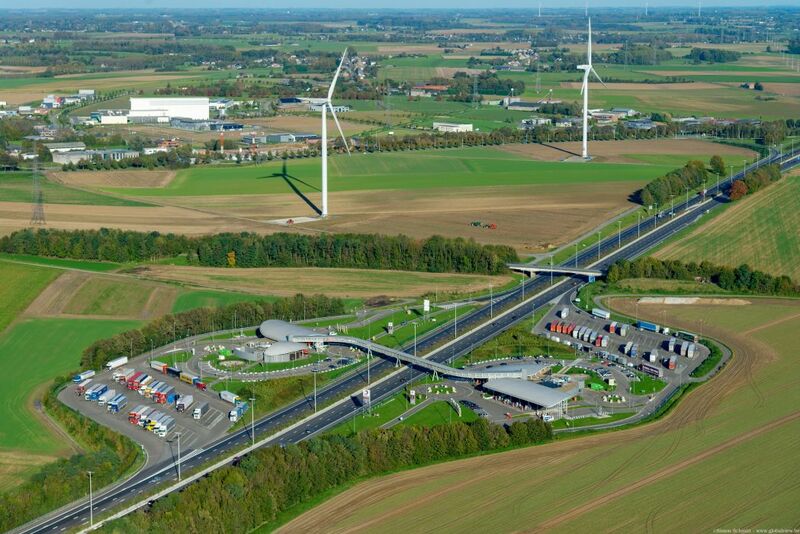 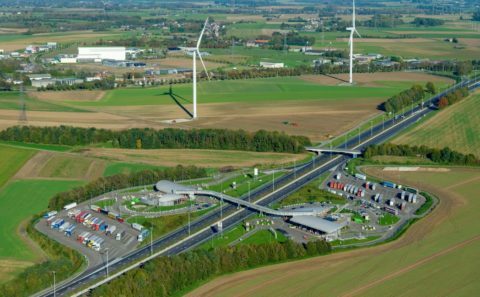 A peripheral row of trees mitigates the visual impact of the service station and the highway from the surrounding countryside. 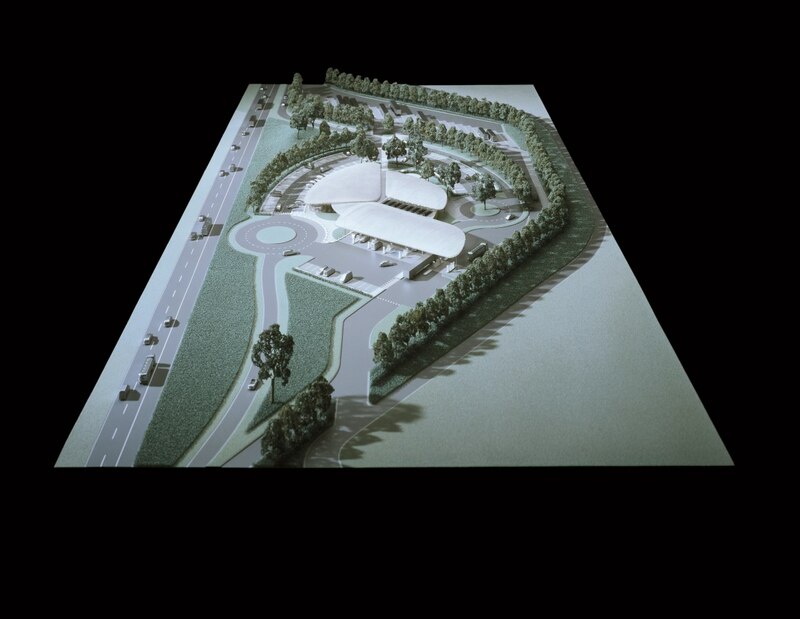 The landscaping of the green zones prolongs the nature of the nearby countryside. 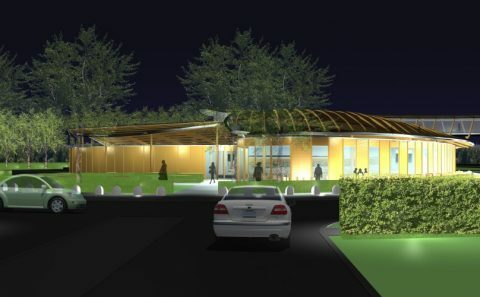 The concern for this contextual, landscaping and regional integration is also reflected in the choice of the principal building materials: the façade and the structure are made of local wood. 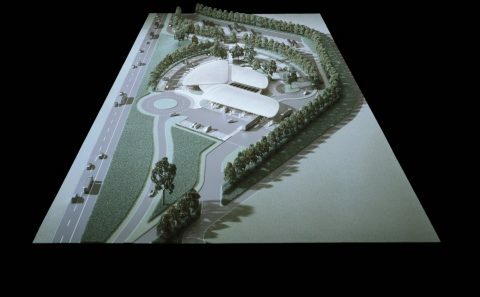 The project includes demolition and remediation of the existing site. 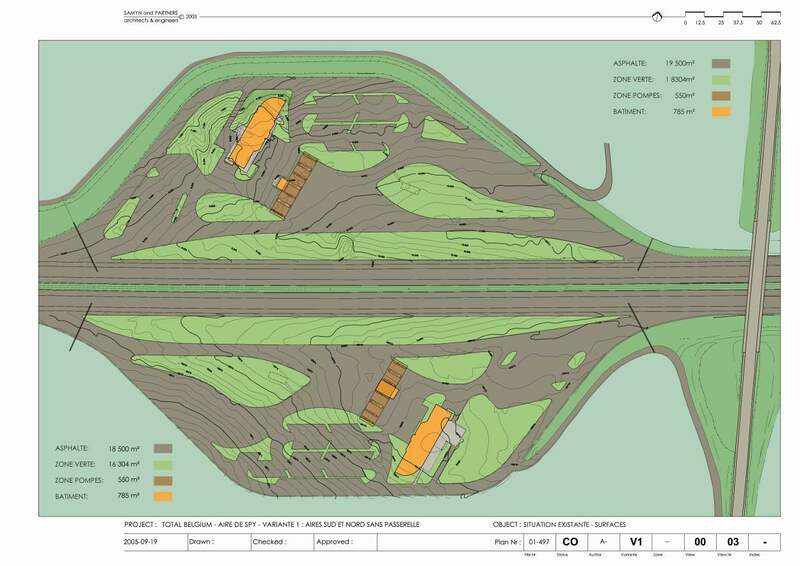 The excavation work is carefully planned; the detritus from the demolition work, if analyses allow, are combined with tillable earth to form a hill. 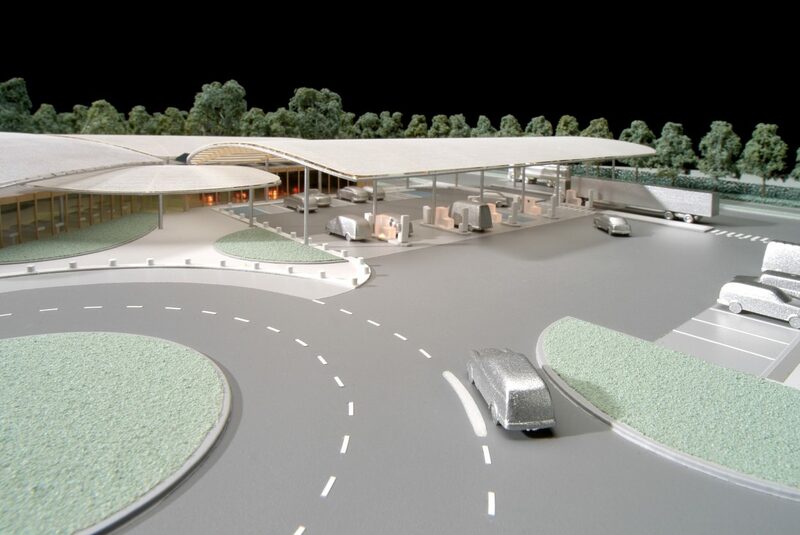 The entire service station is situated at ground level to enable maximum accessibility for those with reduced mobility. 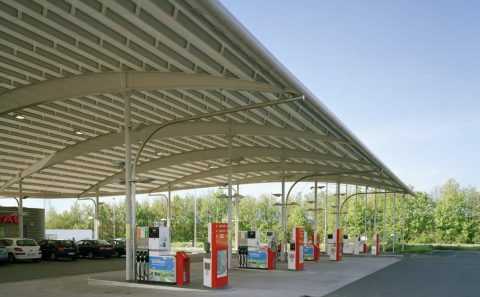 The thermal layer provided by the space between the roofs and the stretched PVC covering of the buildings reduces solar gains to a minimum. 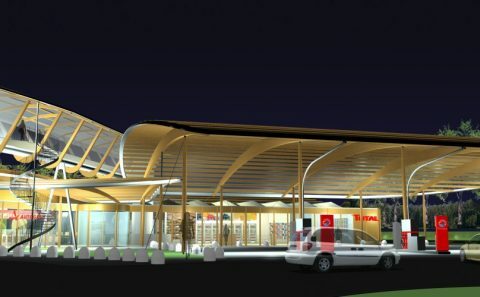 The heat pumps, the Canadian wells, the solar panels, the heat exchangers, significant insulation, the carefully placed windows and glass panels contribute to the three most important environmental principles in energy conservation: maximum reduction of consumption, maximum recuperation, and maximum use of renewable energy sources. 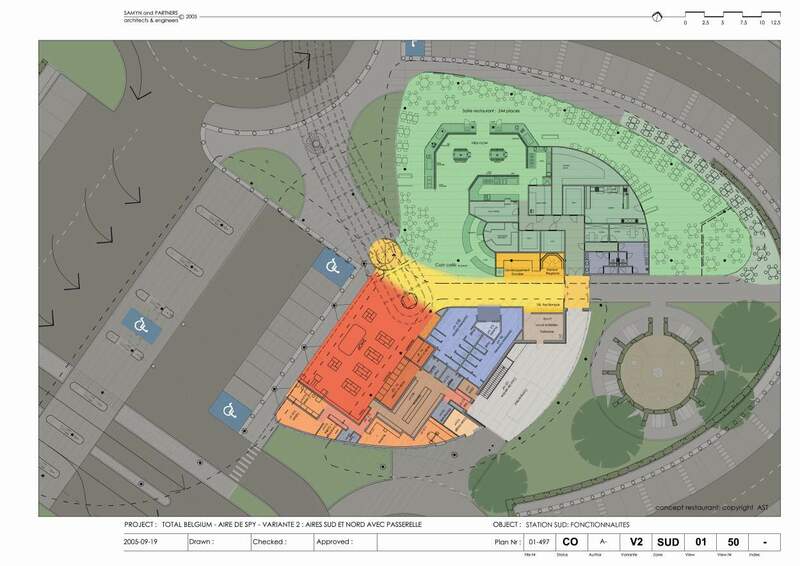 With the interior design, non-recyclable or difficult-to-recycle materials or materials that use a great deal of energy (such as aluminium, solvent-based paints, melamine, plaster wall partitions…) are reduced to a strict minimum. 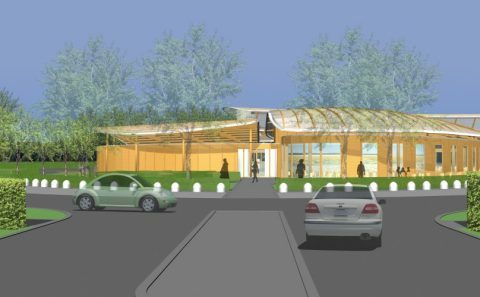 The structure and the window frames are in local wood. 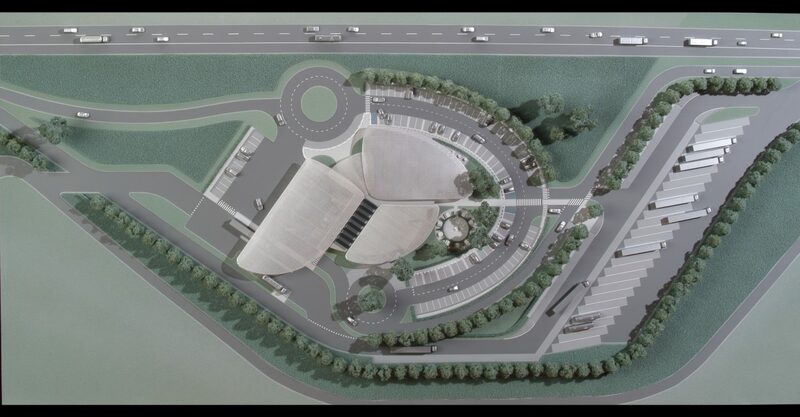 Passengers of buses and cars can descend at the entrance to the building on the patio. 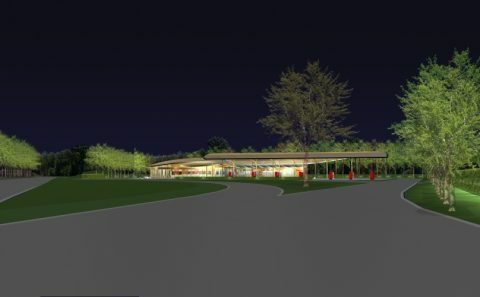 This reinforces the pedestrian aspect of the rest stop environment. 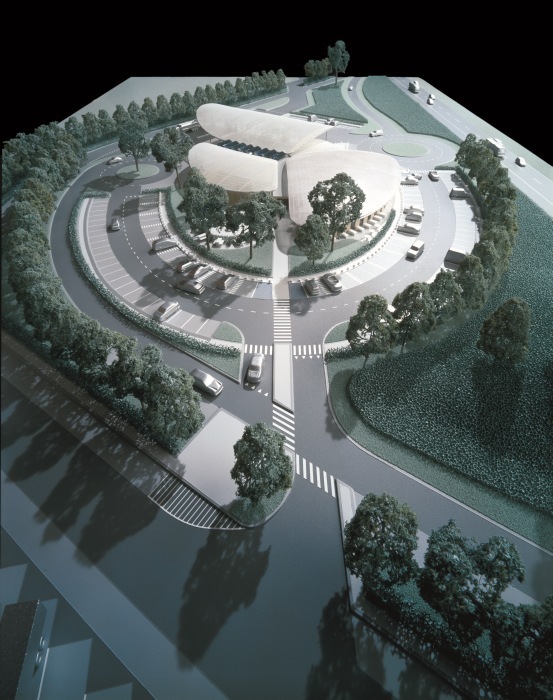 The sidewalks and pedestrian paths are level with the parking area, which enables everyone to access the building in security. 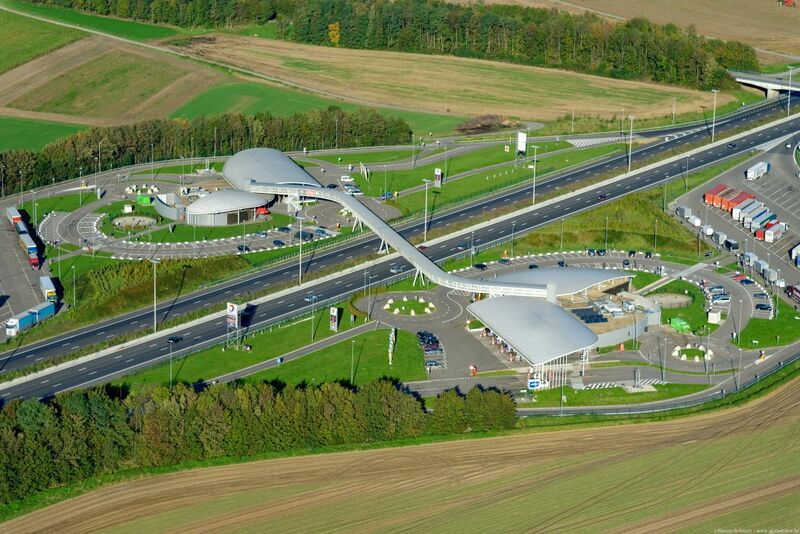 The deceleration of the vehicles is ensured by gently winding roads and roundabouts. 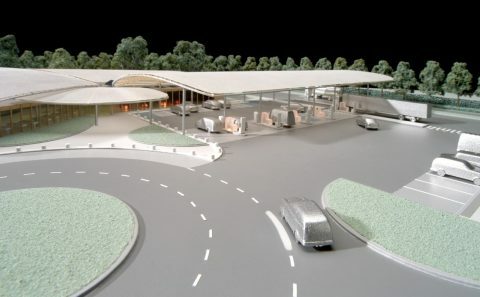 The latter also enable drivers to orient themselves with security. 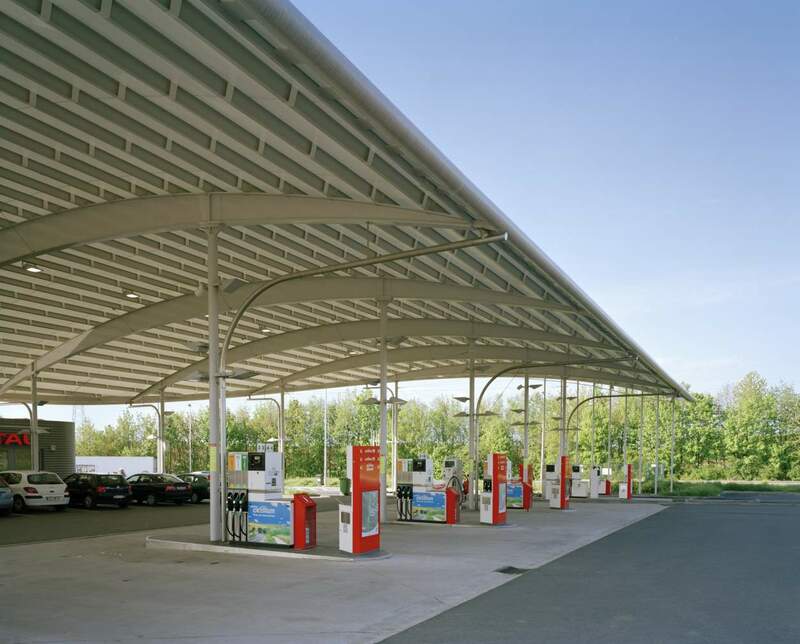 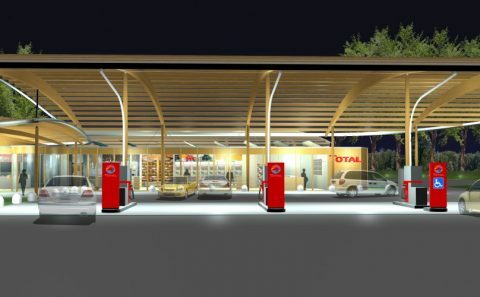 The awning covers all the area of the fuel pumps and enables clients to access the “heart” of the service station while protected from the elements. 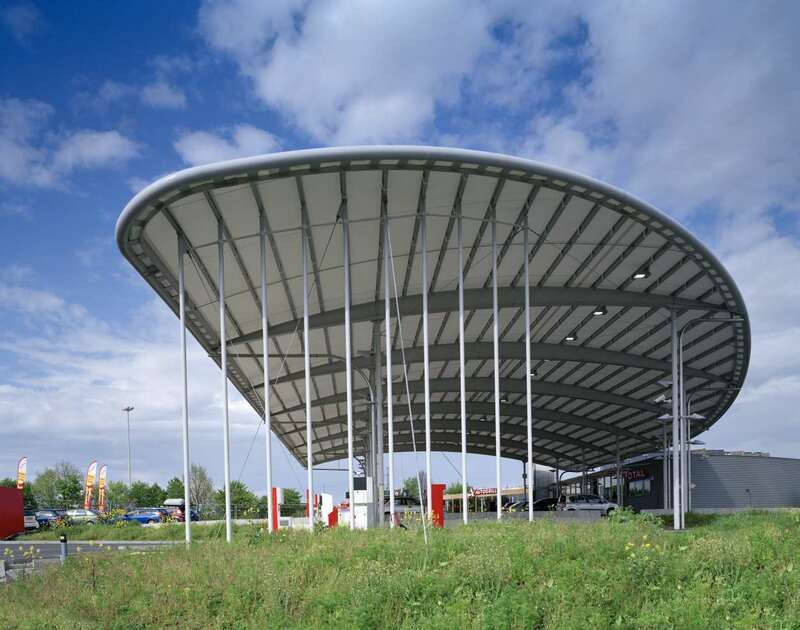 The ensemble of the extended roofs not only protects clients from the rain, but also from the sun with the intention of optimum comfort both inside and outside. 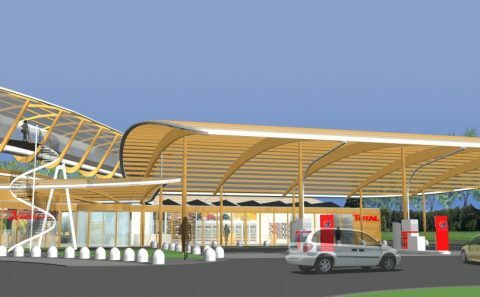 The curves of the building and its roofs, the warmth of the materials used such as stretched PVC and wood, the visual lightness of the wooden lattice facades and the roofs that resemble the wings of a glider contribute, along with other elements of the project, to the creation of a site that is not only designed for the comfort and pleasure of the users, but is also civilly responsible and environmentally friendly. 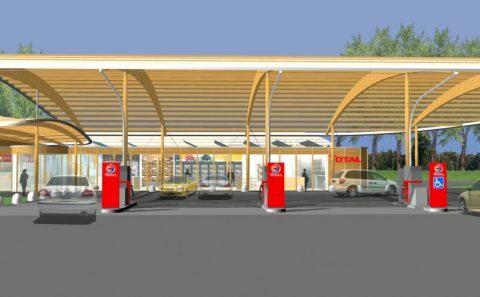 Philippe SAMYN and PARTNERS with SETESCO bvba. 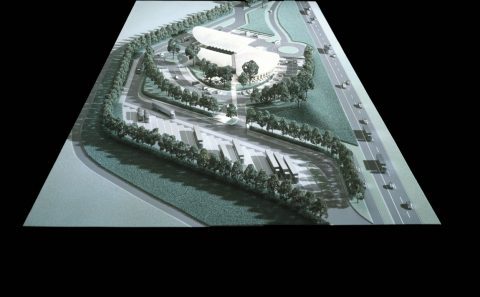 Jean-Philippe DEPOUHON, Philippe HORMAN, Philippe de Mey, Claude Pimpurniaux, Jean François Minne. 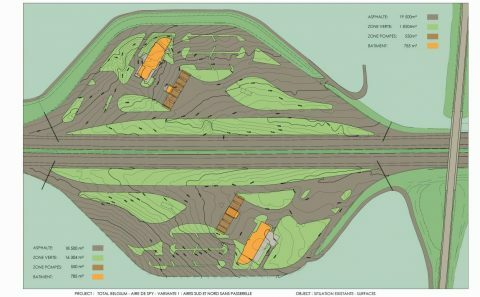 +32 4 23 29 60 41 FAX +32 4 384 65 33. 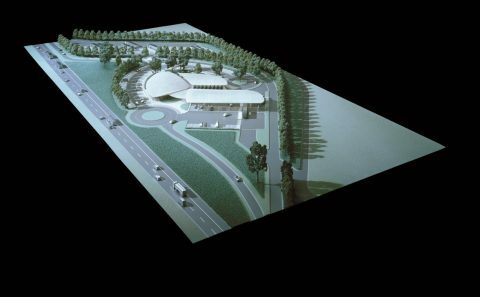 Surface of the buildings : 2.283 sqm, surface of the footbridge : 372 sqm and surface of the site (rest areas North and South) : 67.223 sqm ; 2005 – ; (01/497).